Martin Howard loves “old mechanical things” and is captivated by the “beauty and intrigue” of antique machinery. He chose 19th century typewriters to be his collectable, not from a love of writing (although he is eloquent enough), but from his appreciation for their exquisite workmanship and their intriguing design evolution. Martin is the curator of The Martin Howard Collection enshrined in his personal museum in the basement of his home in the Bluffs. It all started when he found the Caligraph typewriter (1880) in a junk shop thirty years ago. His collection includes such historic machines as the Hall (1881), the world’s first portable typewriter, the Victor with the first ‘daisy wheel’ (1889) and the Crandall – New Model (1887), a black metal beauty adorned with hand-painted roses and in-laid mother-of-pearl. Other remarkable typewriters are the Lambert (1902) with a telephone like dial which is depressed to select the characters and the Fitch 1 (1887) with type bars swinging down from above to hit the top of the roller. These remarkable typewriters are nothing short of industrial art. Martin made a pilgrimage to the place in Milwaukee where Christopher Sholes invented the first commercially successful typewriter. Sholes took his wooden prototype to Remington and Sons who created a metal version which appeared in 1874 called the Sholes and Glidden, a truly revolutionary invention which only wealthy individuals could afford at a cost of $125. In comparison a horse-drawn carriage was $70, a bicycle $12 and a clerk’s wage was $5 a week. A successful business owner might consider one a worthwhile purchase due to its speed, legibility, paper efficiency and ability to produce carbon copies. Sales were very slow for the first few years because of the cost and the shortage of trained typists. In 1881 the first typing school for women opened in the New York YWCA offering new opportunities for women to work in business alongside men, an important step towards emancipation. The turning point came in the mid 1880s when numerous typing classes would provide the needed typists and the typewriter was no longer seen as a novelty but as a necessity for business. In 1896 the Underwood would set the standard for the next century with a bold new design with a four-row straight keyboard, a single shift key and front striking type bars which allows the typist to simultaneously type and see the result. The layout of the keyboard (which Sholes established on his wooden prototype) hasn’t changed in 140 years and is still with us today. Sholes created the “QWERTY” layout (first 6 letters of the second row of characters) to position the type bars to minimize their clashing or sticking together. The letters of the word typewriter are found in the top row of keys, which would have made a demonstration easy for a typewriter salesman without typing skills. Martin’s interest in mechanical things stems from his father who restored horse-drawn carriages and sleighs. The family immigrated to Canada from England. when Martin’s father joined the faculty at the, then new, York University in 1966. Martin had an idyllic childhood in an era when children played outdoors and built things like go-carts and gliders; his father constructed a massive teeter-totter and a pulley ride (zip-line) in their big backyard, the neighbourhood playground. Martin has been collecting since his twenties and fifteen years ago he retired from his job as a research librarian at The Watt Design Group to dedicate himself full-time to his passion. 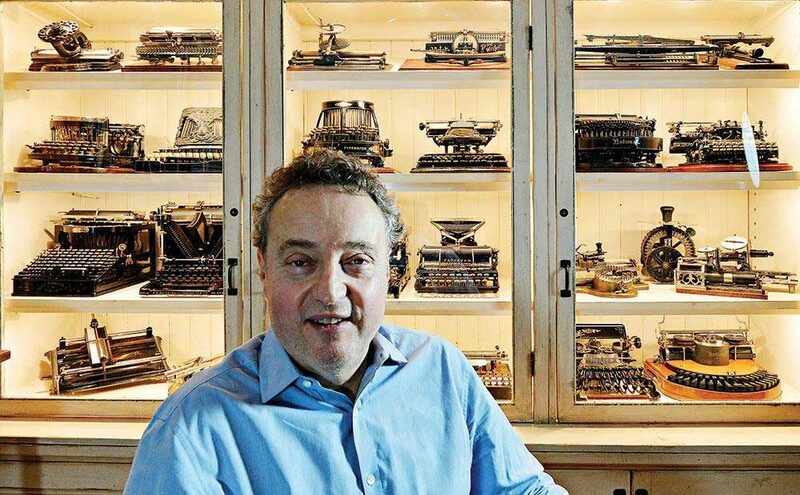 He collects, restores and deals in 19th and 20th Century typewriters. Huge cardboard boxes fill the corners of his workshop ready to be shipped to such faraway places as Moscow, Malaysia and Europe; one even went to Abu Dhabi. He recently flew off to Edinburg to snap up The Waverley typewriter made in London in 1895, one of only 6 known to exist! He exhibits his collection at trade shows and museums; in 2007, twenty of his typewriters were featured at the Royal Ontario Museum. His wife, Susan, a professional soprano and voice teacher, was somewhat concerned when Martin started having a recurring typewriter dream in which he sees shelves of unusual typewriters through a store window but he can’t get in the store. His dream of owning a Sholes and Glidden has never been realized so the search goes on to obtain one. Martin feels he will never shake his interest in typewriters as the variety and ingenuity of the machines seem endless. He chooses to live “working hard and feeling free” and since “love knows no bounds,” his family is proud and supportive. Martin shares the spotlight in a full-length documentary, California Typewriter, with illustrious collector Tom Hanks and famous typewriter enthusiasts, John Mayer, David McCullough and Sam Shepard. The documentary celebrates the physicality of the typewriter and contemplates the effects of the digital era while touting the benefits of analog culture and poignantly chronicles the struggle to survive of California Typewriter, one of the last typewriter repair shops in America. A deal is hard to get today; more people are interested in owning typewriters than were 15 years ago. 20th century models are now in vogue. What’s old is new again! People, especially children, are drawn to things from the analog world with a desire for tactile experience, a need to connect to touch and sound, not experienced in the 2-dimensional digital world. Martin’s enthusiasm is contagious. I was captivated as I stood in front of the illuminated glass case displaying a dazzling array of pure gems. When he gingerly set a rare specimen down in front of me, my first reaction was to reach out and touch it, but I held back and just gazed with reverence at the historical relic. Surprisingly, Martin invited me to try it out. A soft touch will not suffice. The keys have to be pushed with a definite forcefulness. You feel and hear the words landing on the page. How exciting! Martin enjoys the process of show and tell, with no pressure to buy. He invites people to view his website (antiquetypewriters.com) and those who wish to rediscover the joys of the typewriter, to visit his collection in person. Buyers can leave with a treasure under their arm. No shipping required. His is not a virtual store! Will New Condos be the End of Dairy Queen?